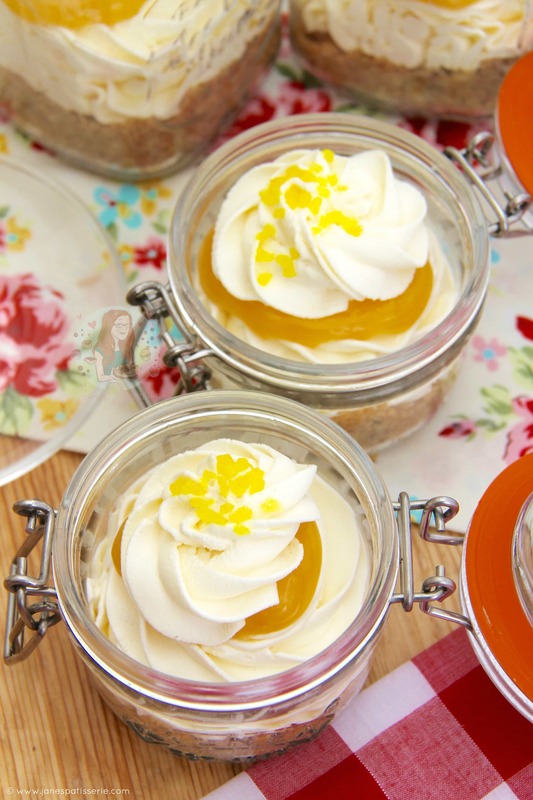 Individual No-Bake Lemon Cheesecakes with lemon curd! Heavenly spring Cheesecakes that the whole Family will enjoy! I have obviously done what feels like a million cheesecake recipes, but who cares… cheesecake is the best. Anyway! As most of my recipes are realistically designed for whole cheesecakes and not mini ones (although, its very easy to make them this way!) I decided that this recipe should be individual ones. 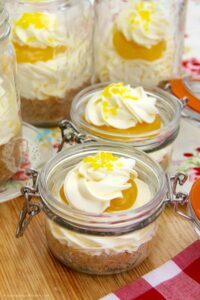 With the cheesecakes being individual, and served in jars or cups, it makes it slightly easier as you don’t have to really have a good thickness with your cheesecake filling. Obviously, its better that way, but its not essential as it doesn’t have to hold itself! 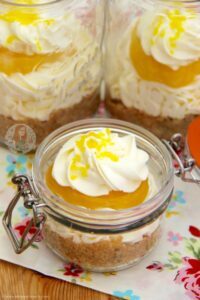 I decided that with this recipe, I would use a simple cheesecake recipe (a plain one) so that I could use some of my Homemade Lemon Curd! I adore lemon curd as its delicious, and Homemade Lemon Curd is even better – however, shop bought can be just as good. I feel like it makes the cheesecakes look a little better as it creates the different textures, but gives the bursts of colour! Also, I thought this would make it a little different to other lemon cheesecake recipes out there! 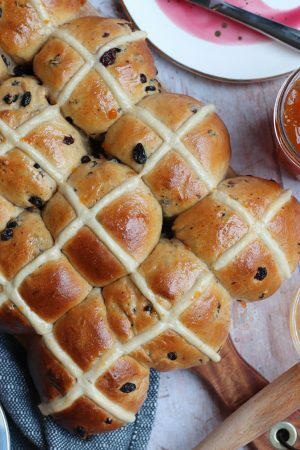 I always use a jumble of jars or glasses or whatever I have hiding in my cupboard – the beauty of something like this is that they look delicious either way. Obviously, my piping skills were a little messy, but that didn’t stop them being delicious. 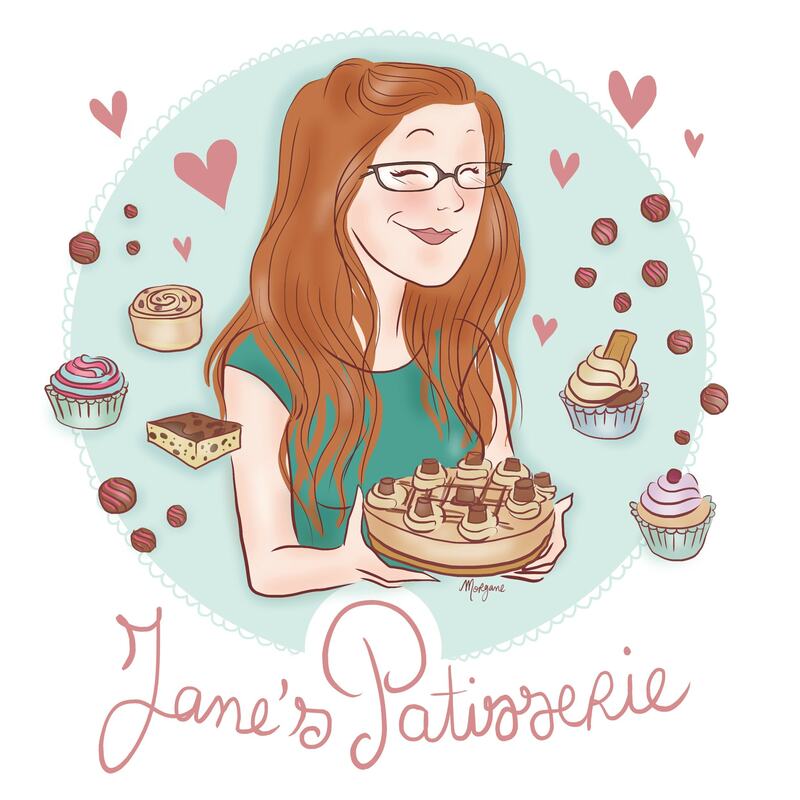 My boyfriend mum gave me the best text review of “Hi Jane, Cheesecake was lush! 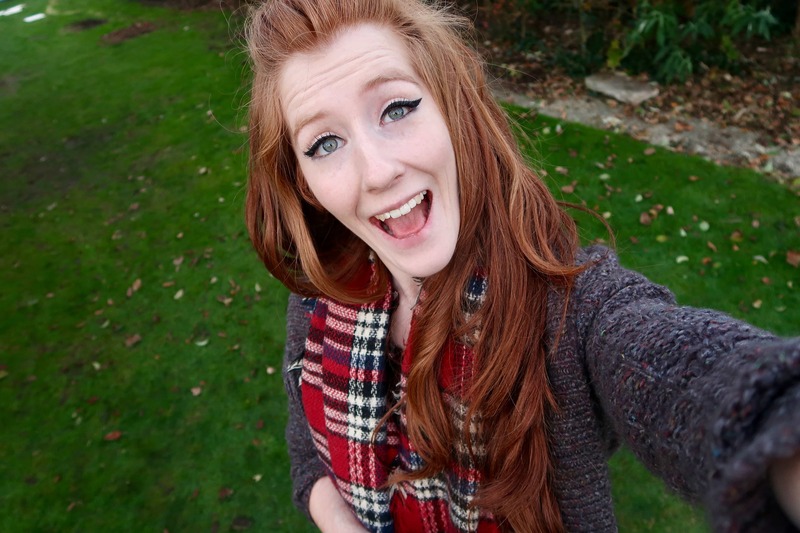 My favourite so far… Luscious Lemon” Which my boyfriend tells me is a TOP review! Always good to impress the inlaws! 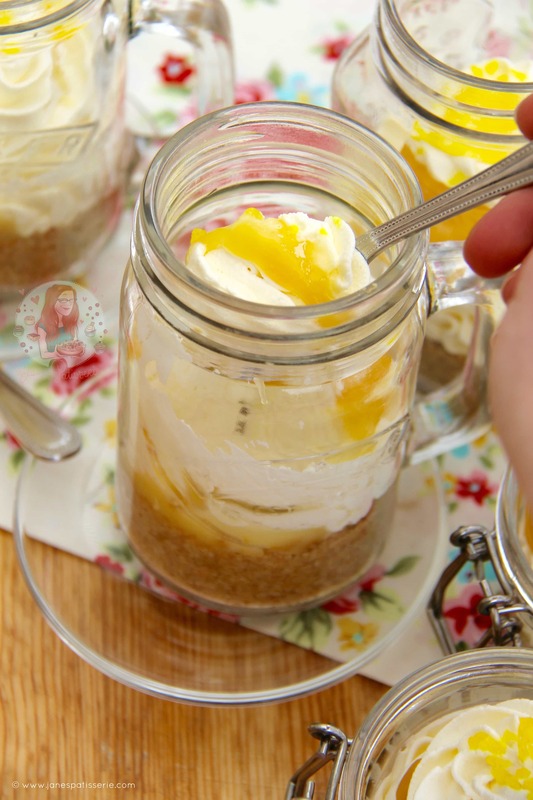 If you want something a little lower fat then these, try my Skinny Mini Cheesecakes which are also served in cute little jars! 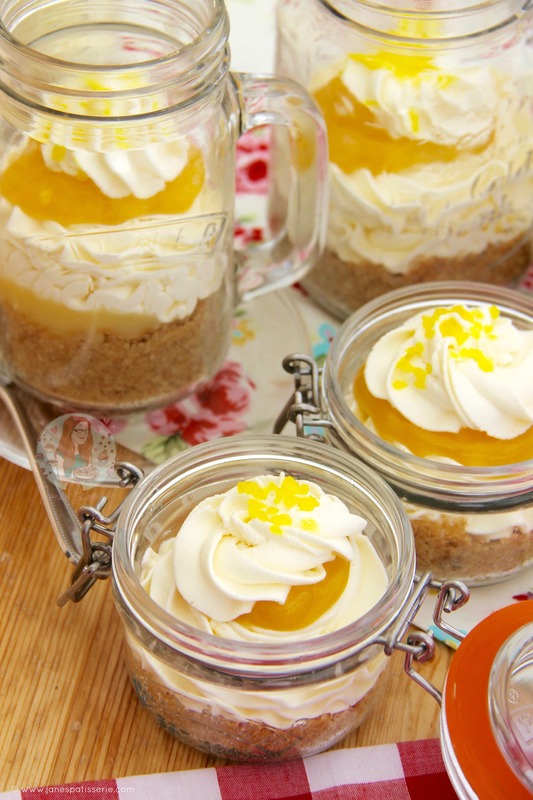 But seriously though, these are little lemony cheesecake jars of heaven that all the family will love. Enjoy! 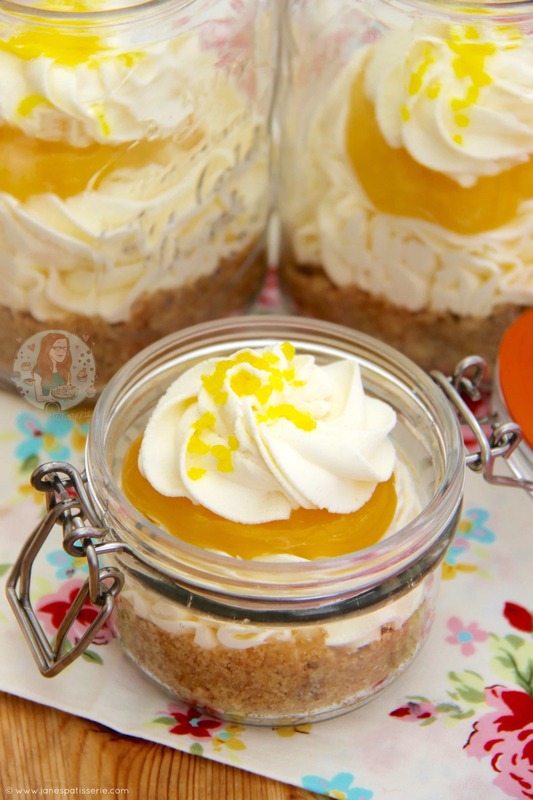 This recipe makes 6-8 Mini Cheesecakes! 1) To Make the Biscuit Bases – Blitz the biscuits in a food processor to a fine crumb and add the melted butter – pulse a few times until it is combined well. Press down firmly into the bottoms of the jars/cups that you use – chill in the refrigerator whilst you do the rest! 2) For the Cheesecake Fillings – With an electric mixer (I used my KitchenAid) Mix the Philadelphia and Icing Sugar briefly together until smooth, it’ll only take a few seconds! Then, whilst whisking on a medium speed (speed 5-6), pour in the liquid double cream and continue to Whip the Cream Cheese/Cream Mixture until it is starting to thicken. 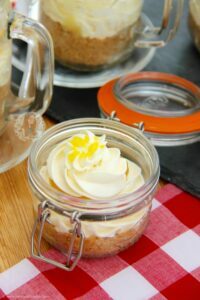 4) When the cheesecake filling is thick (it’s not essential in this one that it holds itself completely as the jar will hold it) spoon in a spoonful of lemon curd onto the cheesecake base – fill a piping bag with a nozzle inside with the cheesecake filling and pipe the mixture on top of the biscuits and lemon curd – Reserve a little filling for the top if you have any spare. 5) Spoon another spoonful of lemon curd onto of the cheesecake filling and with any spare filling, pipe a little rosette on top and sprinkle with any sprinkles that you are using! Leave to set in the fridge, covered, for 1-2 hours. 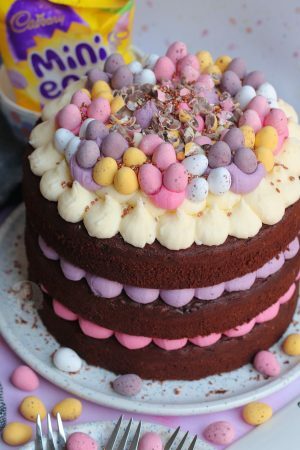 6) To decorate the Cheesecake – If you didn’t use any cheesecake filling, pipe some whipped creamed on and then use any sprinkles you choose! IF you decide to make this as a large cheesecake, I still recommend using a dish with sides as with the addition of lemon curd, it might not set 100% correctly and hold itself! I would also add another 100g of biscuits, and 50g more butter to the base. And set it in the fridge OVERNIGHT if you are making a large one, 1-2 hours will not be long enough! I used a mixture of Clip-Top Kilner Jars, Kilner Drink Jars, and other random drink jars – the size doesn’t really matter as long as it’s no smaller than 250ml as that’s a minimum dessert size in my eyes! These little cheesecakes will last covered in the fridge for 3 days! Older Next post: Salted Caramel Cupcakes! Newer Previous post: Gluten-Free Chocolate Cupcakes! Hi. I’d like to make this yummy cheesecake a large one, so what size of tin should I use. An 8″ one, thats at least 3″ deep. Hi I was wanting to make your no back meringue cheesecake, in Australia we have 250 g packets of cream cheese , your recipes say 2 x 280 g packets of cream cheese , ? Two of your packets would be fine, ours are 280g. Only a 60g difference is fine. Oh my goodness these look amazing! 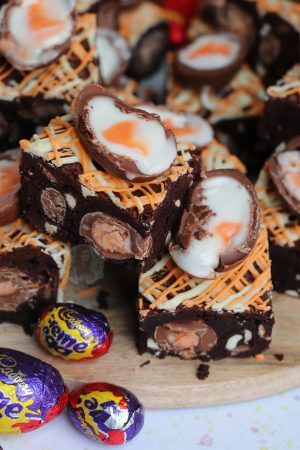 I was looking for something to bake for this weekends Sunday roast pudding but I think I will make these instead! What a fantastic idea! These I am going to try – I love using Greek yoghurt in my cheesecakes but they are not always the sturdiest – this idea would work perfectly!